Yes, that's right. This lady is dressed up as a character we know absolutely nothing about. Nothing! She calls it "The Spirit of the Master Sword", taking a guess that the mysterious character from the concept art tease of the next Zelda game - unveiled at last year's E3 - is just that. The spirit of the Master Sword. Looking at the girl, and then the sword, it's a good guess, and it's a popular one. Who knows, though! She could be Link's sister. Tingle's mum! Some lady. 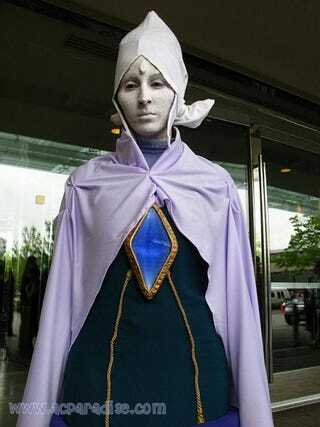 It's a great suit and all (there's even Hylian inscribed around the jewel), but you know things are getting weird when people are willing to devote time and dignity to dressing up as a character that for all we know could be the worst thing to ever happen to the Zelda series!